As foods go, beans are one of the healthiest, cheapest options out there. 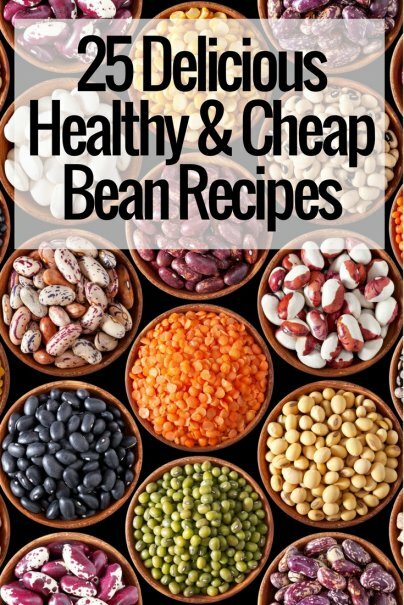 High in protein and fiber and costing just pennies per serving, beans can be dressed up or down, served along with meat or as a protein source all their own, and kept on your pantry shelf for months. Also, it's a point of contention it's better to use dry or canned beans. Personally, I use dry — they're cheaper and don't have extra sodium in them. Canned beans, however, are a great convenience. Use what works for you. Dips and spreads are a great way to use beans. They're also the main reason why I try to keep at least one can of beans around — if I have unexpected guests, it's easy to whip up a bowl of hummus or black bean dip from ingredients in the pantry. All right, yeah, you probably expected to see hummus on this list. But it deserves to be here. It's gosh darn good, and it's easy to make yourself. The paprika-topped hummus recipe from Zahav, one of my favorite restaurants in Philadelphia, is fantastic. If you want a change from the normal hummus, try this baba ganoush recipe — while it isn't typical, this particular version of the eggplant dip includes chickpeas as well. Chickpeas aren't the only beans that lend themselves to a good blended bean dip or spread — this balsamic bean dip uses cannellini beans and balsamic vinegar for a different twist. Oh man, looking at black bean dip recipes makes me want to go to some sort of sports-watching gathering so badly. I must confess, I have kind of an addiction to tortilla chips. Garlic and rosemary are two of my favorite flavors, which means I couldn't resist this white bean spread that, according to the recipe, can be refrigerated for up to two weeks. In the winter, there isn't much that's better than a warm bowl of soup — and protein-filled beans can help make soup a complete meal. This artichoke and white bean soup from EatingWell comes together super fast when you have canned beans and artichokes. Even though it's not your traditional brothy soup, I ate this the last time I was sick. I loved being able to throw it together so fast. This African chickpea stew recipe is very similar to one I used to make for work lunches. With chickpeas, brown rice, sweet potatoes, and kale, it makes a warm and filling one-pot meal. If you need a fast dinner, this quick minestrone from Epicurious can help you out. I almost never think to make black bean soup — why not just make chili? — but whenever I have it, I'm reminded of how much I enjoy it. And it has a lot of great variations. There's this cumin and jalapeno black bean soup, a version topped with a fried egg, one that mixes black and white beans with sweet potatoes, and black bean soup with a generous flavoring of ham hock. Adam at the Amateur Gourmet whips up Ribollita, a soup that combines beans and cheap veggies like cabbage and kale. He also throws in the rind from his Parmesean, which is a great way to flavor soup and use up ALL the cheese. Beans' high protein make them an ideal (and super-frugal) stand-in for meat in meals. My mother's baked beans are one of my favorite recipes of all time. With just a little bit of salt pork, molasses, onion, and garlic, a $1.29 bag of white beans becomes a warm, delicious, and filling main dish that can feed a family and leave leftovers. I serve these with coleslaw and either brown bread or corn bread. Okay, so this chickpea pancake uses somewhat-more-expensive chickpea flour. But it's just too good not to include. Every time I cook it, I'm amazed by how so few ingredients can quickly turn into a delightful, crispy, filling dish. The recipe from Mark Bittman talks about serving it as an appetizer, but my favorite way to serve it is as a main dish, topped with a warm salad of your choice. When I think of bean burritos, I think of two different kinds. The first is like this refried bean burritos recipe — it's similar to one my mom made growing up, except we didn't include rice, added onion, and replaced the salsa with diced tomatoes. The second kind uses whole beans and more ingredients, like this bean burrito recipe from Martha Stewart. You might also know butter beans by their less-popular name — lima beans. In this Spanish-inspired recipe, they're paired with polenta (which you can easily make from scratch instead of buying the prepared tube recommended). I've also made this Cuban black beans recipe with red kidney beans. They work well served over rice as a main dish (and a side of fried plantains, if you feel like it), or as a side dish. There are tons of bean burger recipes out there, based on all sorts of beans and cuisines. This black bean burger recipe is pretty straightforward, while Heidi at 101 Cookbooks recommends a burger with chickpeas. My friend Ashley over at (never home) maker offers up this uber-quick vegan sloppy joes recipe that uses canned vegetarian baked beans as a base, although you could easily substitute your own homemade beans. Go Indian with this spicy chickpea tikka masala. If you have an Indian grocery nearby, visit it to find garam masala (and other Indian spices) on the cheap. You might be floored by how much you've been paying for "exotic" spices at your local grocery store. The blog 30 Bucks a Week follows the adventures of a couple, uh...well, you can probably guess what they're doing. Personally, I love (good) tequila, so I'm pretty excited by this lime tequila black beans recipe. I'm obsessed with anything that features a vinegar tang (except normal pickles — I know, I know, don't yell), which is part of the reason why I'm entranced by this healthy bean and beet dish. All right, yeah, beans are a great stand-in for meat. But sometimes, you want meat too. In that case, use beans as a way to stretch costly meat with these recipes. Make a meaty chili serve more folks with the addition of kidney beans. Make tasty (but not-quite-good-for-you) sausage go further by pairing it with white beans. Or, if you want more vegetables in there, here's a recipe with cannellini, Brussels sprouts, and sausage. Southwestern flavors blend in this shrimp and black bean salad dressed with cilantro, cumin, and lime. Recently, my boyfriend's brother was talking about the secret to feeling full on his new low-carb diet — beans. Use these side dishes to round out your meal, whether you're eating low-carb or not. In this refried beans recipe, the classic Mexican staple gets a perhaps surprising addition — beer. If you already bought chickpea flour for the Socca mentioned above (do it — that recipe is fantastic), use some more of it on these chickpea fries. A tart side dish, collard greens and red beans pair well with Southern fare. Because black bean brownies exist. What are you favorite cheap bean recipes? Share in the comments! That vegan sloppy joe receipe sounds yummy. I've had an extra bag of TVP that I had no idea what to do with - but I think I'll try it! Enchiladas! Made with chicken or turkey and refried beans. I'm so glad you included tikka masala. There's another Indian dish that I am particularly fond of called "rajma" that uses kidney beans in a spicy, stew-like dish that you can put on top of rice.